Courtesy of Keller Williams Hill Country, Carolyn Walker. This beautiful rock farmhouse style home sits in the quiet Hill Country on 2.3 acres with lots of mature trees. Only a 5 minute drive to HEB, Home Depot and lets not forget Starbucks. This home has been well maintained, its a must see!! Great size 5 bedroom 3-1/2 bath, 2 living areas, office, nice kitchen w/ island and breakfast area, formal dining area and bonus game room above 3 car garage. Plenty of storage also. 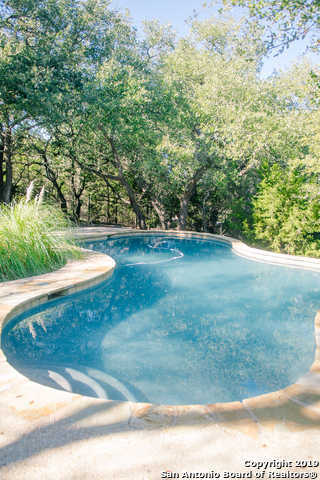 Nice fenced in back yard with beautiful Keith Zars pool, and a circle driveway. Please, send me more information on this property: MLS# 1357110 – $499,900 – 1381 River Way, Spring Branch, TX 78070. I would like to schedule a showing appointment for this property: MLS# 1357110 – $499,900 – 1381 River Way, Spring Branch, TX 78070.